The Indian Army is always ready to fight the enemy. The latest military exercise Vajra Shakti illustrates its resolve to keep itself updated with the latest technology in modern warfare. Operation Vajra Shakti, which began on May 1 on the banks of river Sutlej in Punjab near the Pakistan border concluded on Tuesday. The riverbed of Sutlej was the area of hectic military exercises involving 25,000 troops. 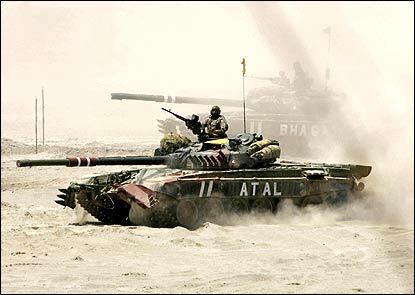 Indian Army tanks take part in the 'Vajra Shakti' (Power of Thunder) army exercise.